My secret tip: a hide-away close to Itanos. My favourite beach in the northern east of Crete. Last June staying in Palekastro, we tried to find a nudist beach, where we also could find some shadow. After we had been swimming at Maridati beach, which is beautiful, we must escape of the burning sun. 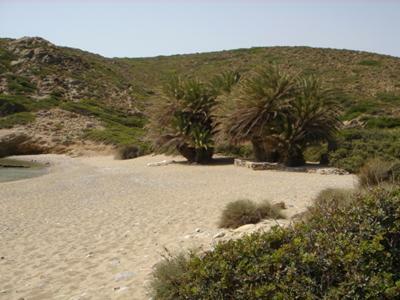 So we found a little bay north of Itanos with a sandy beach and the shadow of old big palms. Not liking the crowds on the beach of Vai, we have been so happy to discover this lonesome place only for the two of us. 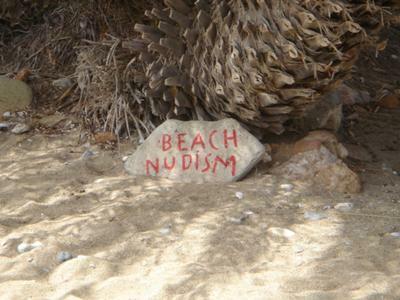 And we liked it so much more, when we saw something like an 'invitation': a stone with writing 'nudist beach'! But we didn't stay all alone, after a while a Greek man, tanned all over, appeared, and he seemed to be here 'at home'. There was a table and something like a bench, all built with stones, he had a sun chair, too. As we worried about this could be his 'private beach' and asked him. He intimated to us, we should stay, very friendly. His English was equal to my Greek, both 'mikro ligos', but we understood. He was Yannis, living in Sitia and spending his free afternoons all the year here. We met him every day, all the week, he never was flashy, but always friendly. Very seldom other people came to swim for a while or to stay for a shorter time, but mostly we had been alone, beyond the palms and only a few feet away of the wonderful sea. This my secret insider tip, please tell nobody! And if 'Yannis' will read this: my best regards! Thanks for sharing your story with us and everyone on the web. I don't know if you really wanted it to be a secret...? Happy Sunbaking in Kriti! Crete in summer at the beach, mmm that is something to look forward to. We love the east of Crete too, it is really possible to find tranquility like you did. Peace and quiet and wonderful beaches. Shh, don't tell anyone!